HFSC funding is approved for most lighting applications; however, funding is allocated to projects that will substantially decrease energy consumption through the utilization of energy efficient lighting technology. Through its strategic partners, HFSC is able to provide funding for technology that is otherwise difficult to acquire because of the high price associated with green lighting technology. 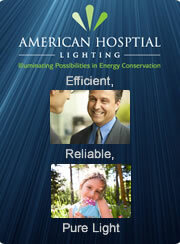 Indoor Lighting Solutions (ECL-Indoor). The Energy Conservation Lighting Program is designed to provide financial assistance to healthcare facilities in need of funding for interior lighting retrofit projects. Technology utilized for indoor projects include environmentally friendly LED T-8 lamps and energy efficient T-5 and T-8 fluorescent lamps. Color temperatures include: Warm White (2700K), Natural White (4100K), Day White (5800K), and Cool White (7000K). Outdoor Lighting Solutions (ECL-Outdoor). The Energy Conservation Lighting Program is designed to provide financial assistance to healthcare facilities in need of funding for exterior lighting retrofit projects. As a requirement for the program, all lamp technology must be Energy-Star approved that save energy, reduce CO2 emissions, and are maintenance free up to 100,000 hours. The Green induction outdoor lights are recommended for garages, wallpacks, shoeboxes, security, and tunnels. Fluorescent Lighting Efficiency Boost Solutions (ECL-Efficiency). Through the implementation of patented equipment that is designed to lower kWh consumption in fluorescent lighting systems, the ECL-Efficiency boost solution provides a unique means to save energy. Savings may be as great as 15% with nominal foot-candle loss. Designs are available for parking garages, warehouse facilities, and for any electrical panel that is specifically designated for exclusive use in a fluorescent lighting system.